Friends of the Osa’s successful Sea Turtle Conservation Program continued in 2009 on the Piro and Pejeperro beaches on the southern shores of Osa Peninsula in Costa Rica, Central America. FOO staff, visiting biologists, students and volunteers from around the world participated in working for the protection and study of sea turtles visiting these beaches. Manuel Sánchez is the field coordinator for this season, accompanied by his field assistant, Ronald Villalobos; both an example of the efforts of FOO to hire local people for its projects. Manuel was born in the area and has spent his life on these beaches, on the Piro river estuary and the lands of the Osa Biodiversity Center (OBC). Not only is he finely attuned to the rhythms and behaviors of the turtles, he is an expert spotter of all kinds of wildlife and an aspiring photographer. We would like to send out a very BIG thank you to all of our 2009 volunteers and an even BIGGER thank you to our two Research Field Assistants, Jim Ward and Liam Hogg, who both dedicated three months to FOO’s sea turtle conservation program in 2009. We couldn’t have done it without you! In 2009, Friends of the Osa protected 240 nests on Piro Beach and 164 nests on Pejeperro Beach of the Olive Ridley sea turtle (Lepidochelys olivacea). We were able to protect all 12 Black Turtle nests (Chelonia mydas – agassizii) we discovered on Pejeperro Beach. No Black turtles were observed nesting on Piro Beach in 2009. As for Green Turtles (Chelonia mydas agassizii), just three nests were reported in Pejeperro. These three turtle species are threatened. 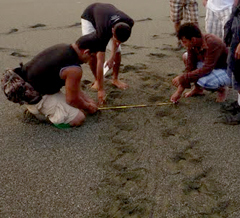 Activities included: two teams doing nightly patrols of the two beaches, monitoring the arrival of the nesting turtles, counting nests and attempts at nesting (false crawls,) marking confirmed nests, tagging and measuring of sea turtles encountered while nesting. Patrols visited the beaches each morning, and where possible placed wire mesh over nests to cut down on predation by wildlife, such as coatis, and feral dogs. Nests were visited after the hatching, and shell remains and nest mortality were tallied. In addition the team did daily and nightly collection of sand temperatures at the depths sea turtles bury their eggs. Our presence on this remote beach has also helped to reduce poaching in the area. In response to the concerns about turtle egg poaching, MINAET (the Costa Rican Ministry of the Interior,) has been conducting patrols on roads and on the beach, which have been effective at reducing the presence of egg-looters in the area. Overall predation has been low this season, as a total of 24 nests have been preyed upon in Piro and only two in Pejeperro. Piro and Pejeperro beaches, extending northwest from Matapalo point, are wild and untrammeled, far from any city or town, facing directly into the powerful Pacific currents. Situated near the OBC campus, they represent a rare habitat in this hemisphere where the rainforest touches the ocean. The sea turtles nesting here are returning to the beaches where they were hatched. They travel long distances across the Pacific in their feeding, mating and nesting. 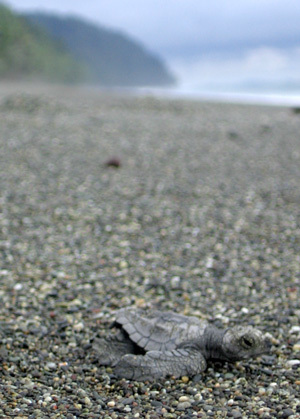 The female hatchlings that leave the beach each year may not return to nest for up to 20 years. Females may need to make multiple attempts to nest successfully, and some will return to lay more than once a season. They face a gauntlet of hazards, from wildlife predation as hatchlings during their first hours on the beach and in the ocean, to suffocation as adults from ingesting plastic bags mistaken for jelly fish. Above all, to nest they must brave a wall of death off the Pacific Coast in the form of fleets of long-line fishing boats. The turtles face drowning when they are accidentally ensnared. These magnificent, ancient creatures fascinate with their timeless migrations–yet their long term survival is uncertain. Our efforts will continue on Piro and Pejeperro beaches, and in conjunction with other local and international efforts, until their survival can be assured. For the 2010 season, Friends of the Osa, with support from El Tigre Fund and in partnership with Carate lodges, is expanding our Sea Turtle Conservation Program to cover Oro Beach and Carate Beach. For this effort to be successful, we will need the help of many more volunteers! Please visit our volunteer page to sign up for the 2010 season. Volunteers patrolling Piro and Pejeperro Beaches are housed at the OBC’s rustic but pleasant facilities, and give a donation to cover the cost of the three daily meals prepared by the OBC’s staff. Or you can sign up with a partner lodge and help protect the endangered sea turtles on Oro and Carate Beaches. Also in 2009, locals from the Carate community, including nature guides, were trained on sea turtle conservation and techniques. The community is getting organized and is considering creating a turtle hatchery, with the help of the Sustainability Committee of Carate, La Leona Lodge, Luna Lodge, Finca Exótica, Carate Wildlife Refuge, El Trigre Fund, MINAET and FOO.